TEMPORARILY TOUGH TATTOOS. Are you tough? Or maybe you just want to look tough without any pain or stigmas? Then 4X2 is perfect 4 U! 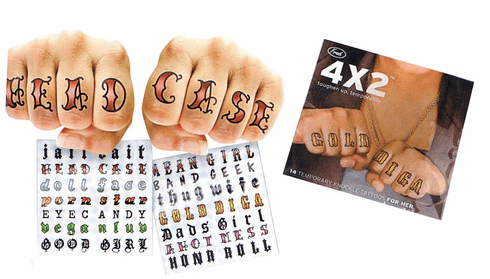 These temporary tattoos adhere to each of your knuckles and offer such classic witticism as This Hurt, Last Call, Babe Mgnt, Eye Candy Doll Face.